Finally I have a couple of before photographs to show you. These rather bad photos were taken on the morning we moved out, so the rooms are partially bare, partially furnished with the last couple of items. 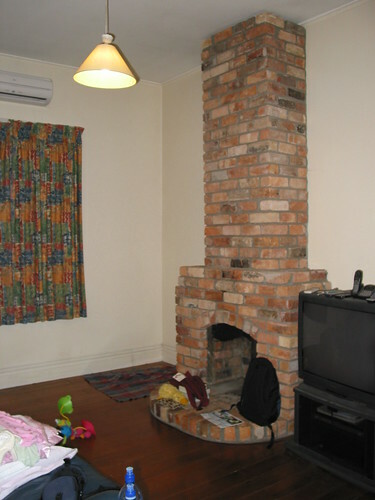 This is the fireplace and dodgy closet in the front bedroom with the bay windows. Both of which are no longer there now. This is the old hallway with Benny in the foreground and all our junk waiting to travel with us in the living room. Looking through the door into the old kitchen and out into the back yard. 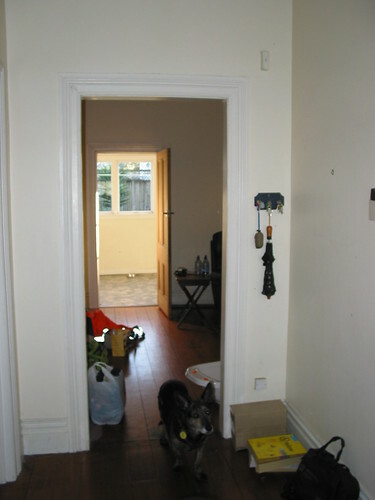 The hallway doorway is no longer there and neither is the old kitchen and bad lino. In its place is a large, long, full height hallway; a newly enclosed room and the old kitchen is currently now a concrete pad and some framing. 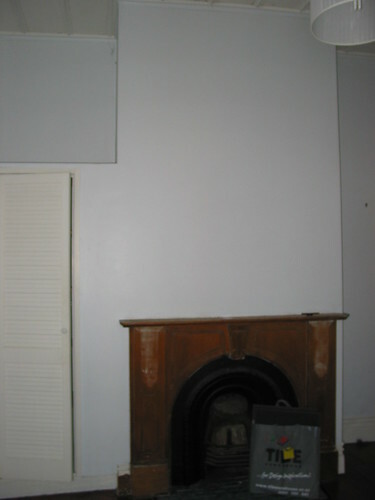 This is the old living room looking from the kitchen door across the fireplace. The fireplace no longer exists, the french doors are gone and this area is enclosed with a new wall. We are planning a short visit to home tomorrow, so hopefully I will be able to show you these rooms from about the same vantage point in tomorrow’s blog entry.